Until the early 70s and the success of the Golf, Volkswagen was always known for their unwavering dedication to their rear engine/rear drive platform. That’s why it’s so surprising to find that the first all-internally designed car at VW was front engine/front drive. More surprising is how close that car is to their later rival, the Mini. Maybe I’m overstating things a bit. VW’s car was the prototype called EA 48, and it wasn’t transverse-engined like a Mini, which is a pretty crucial part of the Mini’s design. But it was a small, highly space-efficent little two-box car, with a small power unit driving the front wheels and almost all mechanical elements crammed up front under a stubby hood. Like the Mini, smaller wheels were specially chosen to not encroach on interior space, and the fundamental design and look are remarkably similar to the Mini, which would be developed two years later. The EA 48 was the first car Volkswagen designed totally in-house, as opposed to the Beetle and derivatives, which were designed by Ferdinand Porsche (with major input from many others, including Josef Ganz). The clean-sheet design started with the idea that VW needed a car below the Beetle, which is a hard concept for many Americans to imagine, especially in the 1950s, when a Beetle was about as cheap and basic a car as you could get. Unless you wanted a King Midget or something, but hardly anyone really did. The EA 48 was powered by, basically, half a VW flat-four, a 700cc flat-twin. Since Beetle engines in this era were only about 1200cc, I guess it used slightly larger cylinders, though I’m not entirely sure. The engine made about 19 HP, and in power, design, and size seems pretty close to a Citroën 2CV engine of that era. In fact, the basic drivetrain design is really very close to a 2CV, which makes me wonder if that was one of the target competitors VW was looking at. Design-wise, though, it feels much more like the Mini that would come later. Like the Mini, it’s essentially a bigger box mated to a smaller engine-box up front. Also like the Mini, special tires had to be ordered for smaller-than-normal wheels — in this case, 4.80 x13 tires from Continental. The EA 48 I think looks remarkably un-VW-like, with its rakish side modeling that becomes the rear wheelarch and the very mustachio-looking front air intake. The prototype lacks rear quarter windows for cost and camouflage reasons (VW had no test tracks, and tested their cars in public — I guess they thought people would assume it’s just a little van?). The prototype also has no rear hatch or trunk opening, which you’d think would make a lot of sense for the design. It seems one wasn’t planned for production because the goal was to keep the car as cheap as possible, though a hatch as an extra wasn’t ruled out. An interesting technical detail is in the front suspension, which is, essentially, a coilover MacPherson strut setup. The MacPherson setup was only developed four years earlier in the US, but it appears that its use on the EA 48 is the first time such a suspension was used in a front engine/front drive context, which would make the EA 48 the grandfather of almost every FWD car on the road today, since this is by far one of the most common FWD suspension designs. Most of this innovative design work was done by an engineer who’d previously worked at Lloyd, a company that had a good bit of experience making small FWD cars. And, really, the EA 48 proved to be a much more accurate view of what VW’s distant future — and the future of most small, economy cars — than anything VW would make until they came back to this idea with the Golf, Polo, and all the FWD cars they continue making to this day. Eventually, the EA 48 was killed by the German government itself — German economic minister Ludwig Erhard warned VW that entering the sub-Beetle sector would be too damaging to other companies. 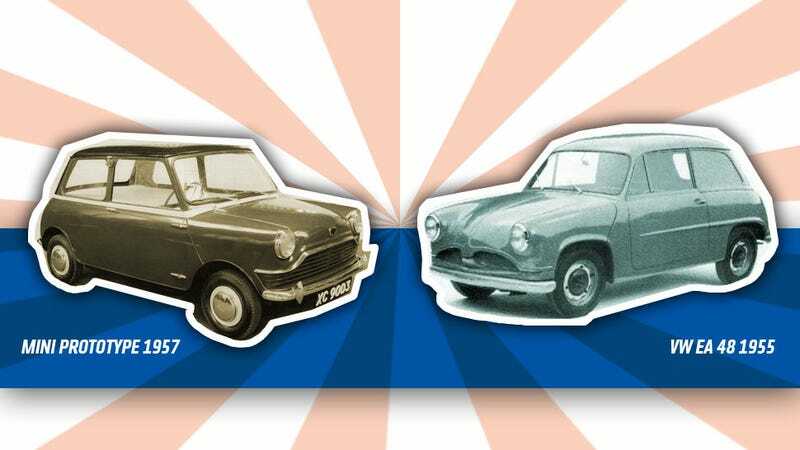 Companies like Borgward, which owned Goliath and, yes, Lloyd, which had given the engineer that came up with the EA 48 in the first place. In a way, I’m glad the EA 48 didn’t take off, because I fear its clever, rational design may have been a huge success, like it was with Issigonas’ Mini, and we would have not had the wonderfully quirky VW rear-engine platforms as long as we did. But I can’t help but admire how clever and prescient this mostly forgotten little sub-Beetle really is.